The main section of Fontainebleau State Park, consisting of 2,800 mostly pine-wooded acres on the lakeside of the highway and bounded by Lake Pontchartrain and Cane Bayou, was developed between 1938 and 1942 and built by 215 young men from the Civilian Conservation Corps (CCC). The park bears the name of Bernard de Marigny’s sugar plantation, which formerly occupied this site and was itself named after the estate of the French king Francois I. By the time the Louisiana Department of Conservation purchased the site in 1938, it was owned by the Great Southern Lumber Company, which had established the mill town of Bogalusa in Washington Parish. The development of Fontainebleau Park was carried out by the State Parks Commission in consultation with the National Park Service; landscape architect William W. Wells designed the plan to emphasize recreational activities. Although some components such as a boating lagoon and a lodge were never built, the park, as a whole, reflects his scheme. New Orleans architect Theodore Perrier designed several of the park’s structures. Wells wrote in his report of l 939, “All of the buildings are being kept in the early Louisiana style of architecture.” The main entrance is marked by brick piers and flanking low walls and by an octagonal brick pigeonnier to one side. Just inside the entrance is a small one-story galleried cottage, formerly a ranger’s dwelling. Other structures include a brick bathhouse (1939) with a Doric portico and cupola, a colonnaded shelter (1940) with open pavilions at each end, and a hip-roofed brick restroom fronted by a Doric porch (1940), The ruins of Marigny’s sugar mill (1829), including two brick chimneys, were incorporated into Wells’s landscape design, as was the plantation’s oak allée. Structures built subsequent to the CCC work include a hip­roofed picnic shelter (1946) and, on the park’s western perimeter, four concrete tepee-shaped buildings constructed when the Boy Scouts owned this area of the park. A small group camp, with separate access from U.S. 190 on the park’s eastern perimeter (1947–1948), consists of two dormitory buildings and a dining hall. Lakefront cabins were added in recent years. The Tammany Trace, an abandoned railroad line converted to recreational use as a 31-mile-long walking and biking path, is routed through the park. Kingsley, Karen "Fontainebleau State Park." In https://64parishes.org Encyclopedia of Louisiana, edited by David Johnson. Louisiana Endowment for the Humanities, 2010–. 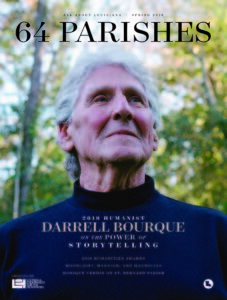 Article published February 17, 2015. https://64parishes.org/entry/fontainebleau-state-park.